What sparked my enduring fascination with Egypt? 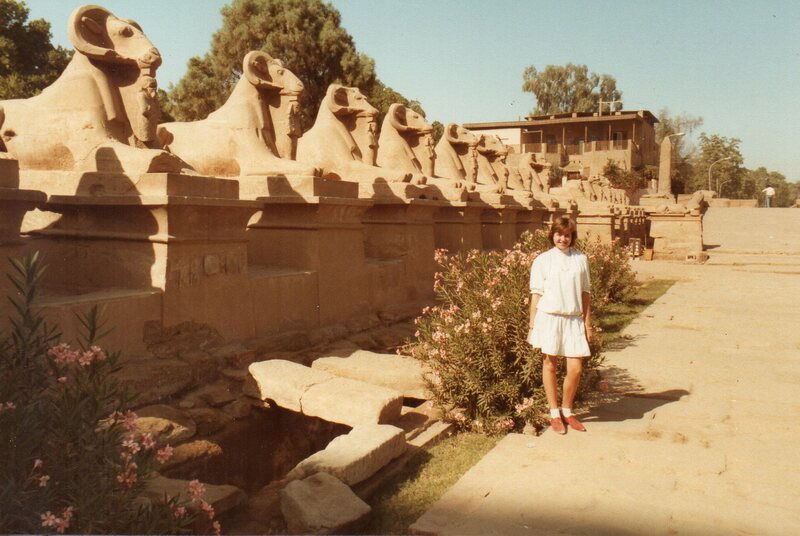 Ok, so here I am aged 16 with the ram-headed sphinxes at Karnak. It’s October 1983. I’m on my half-term break. I’m in Egypt with my parents and younger brother, on the cheap, courtesy of my dad working for an airline and qualifying for concessionary travel. Cute red pixie shoes, huh? It took me almost thirty years to actually start writing adventure stories about the land of the pharaohs. Yet the fascination was sparked back then. Why? Perhaps something in the light quality? It’s a soft pink in Egypt – you can kind of see it in the sky in the photo as it fades to the distance. I think this has something to do with the quantities of sand and dust in the atmosphere, and so little rain. Whatever, it makes for some of the most spectacular sunsets on earth. And a filmy haze over everything that’s like looking at everything in soft-focus. There’s something very romantic about light quality I think. Then there’s the immense SCALE of everything. Standing on the giza plateau and craning up at the great pyramid. Likewise in Karnak, dwarfed by the columns in the Hypostyle Hall. How did they do it without modern equipment and engineering? Was it spacemen? As a teenager, this was an intriguing thought! And, of course, the history. Stepping into the thick, stifling atmosphere of a centuries-old tomb that looks as if the artisans laid down their paint-pots just yesterday. Learning from the guide that they got light into the depths of their ancient sepulchres while they were carving and decorating them by reflecting the sun from great sheets of electrum at the tomb entrance. True? Possibly – not sure if it was really electrum ! But the guides demonstrated it ably enough with a metal biscuit tin. Standing inside Tutankhamun’s tomb … gawping at the sarcophagus that still contains the remains of the boy king … Trying unsuccessfully to grapple with the unimaginable period of time – thirty centuries – that he’d been there. Or perhaps it was the weird and wonderful stories about the pharaohs and their queens themselves. Did Ramses II REALY have more than two hundred children, some by his own daughters? It was a thought to make me squirm – standing alongside my own father listening to the guide. Were brothers and sisters REALLY married to each other? I remember looking at my fourteen year old brother and thinking ‘ugh’. So somehow, it’s all larger than life, a little bit Hollywood, and desperately mysterious and intriguing. Nowhere like it on earth ! It reached out and grabbed me. Almost thirty years later it shows no sign of letting go. Posted on January 30, 2013 by Fiona Deal. This entry was posted in Uncategorized and tagged egypt, Great Pyramid of Giza, Karnak, Ramesses II. Bookmark the permalink.